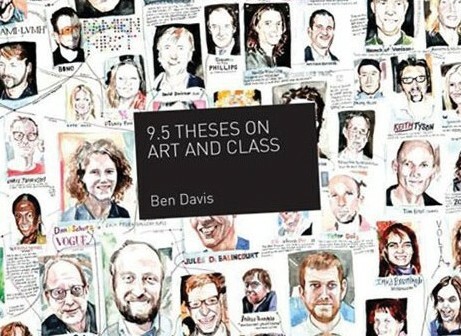 I wrote my book, 9.5 Theses on Art and Class , in the spirit of renewing a discussion about the relationship between leftist politics, culture, and the economic order we live under. That’s a spirit that I think the editors of Jacobin share. For that reason, I was disappointed by Rachel Wetzler’s review of my book. Not because she disagrees with me – as she notes, there are lots of ideas in the book, and not everyone is going to connect with every single one of them. But while charging me with engaging in “lazy caricatures” of theorists I disagree with, what Wetzler has really produced is a lazy caricature of my own theoretical position. In fixating on textual and rhetorical issues, her review obscures a vital discussion about politics and the visual arts that might actually interest readers of Jacobin . The book itself stands as a refutation of most of Wetzler’s complaints, but I would like to set the record straight on one particular point, then spell out the political stakes of our disagreement in a way that she does not. [H]e draws the crudely reductive conclusion that the problems faced by women artists today are ultimately rooted in the turn towards “the mumbo-jumbo of postmodern identity politics,” which have resulted in the “strange and disorienting postfeminist quagmire of the new millennium.” Putting aside the truly galling notion of a male critic telling women artists that they’re doing feminism wrong, this hinges on the far from uncontestable assumption that the concerns of historically marginalized groups are a distraction from the bigger, better cause, and that their grievances will be organically resolved through class struggle. Most Jacobin readers will recognize that the notion that Marxists reduce everything to economics is a stock charge, almost a reflex of anti–Marxist critics. My book happens to be about how a Marxist theory of class might be particularly clarifying when it comes to various questions concerning contemporary artistic labor. But I do not believe that struggles around class trump struggles around other kinds of oppression — that’s part of why I wrote this chapter. Since I’m aware of needing to cut against the stereotype, however, I actually slightly altered the final version of this line before the book was published, losing the too-dismissive “mumbo-jumbo.” (Wetzler is quoting from the uncorrected proof and appears not to have checked the citation against the final text.) More importantly, just two paragraphs after the sentence she picks out, I actually have a passage that states plainly, “Sexism has its own dynamics that have to be specially combated” — a pretty clear verdict on the matter, I think. [A] thirty-year backlash against feminism can’t help but take a toll. Without a dynamic and activist-oriented women’s rights movement, institutional gains remain fragile and contradictory. Mainstream women’s rights organizations, dominated by middle-class politics, became more focused on lobbying largely perfidious politicians than on mobilizing numbers to protests. In the arena of art, as in the academy in general, feminism turned towards postmodern identity politics, away from even a symbolic connection to popular protest. Meanwhile, the golden lure of individual success for a few superstars in a booming art market distracted from the importance of arguing for systematic accountability and provided a context in which persistent biases could fester. What should be evident here is that I definitely do not place a turn to theory as the “ultimate root” of post-feminism, as Wetzler paints it. I offer a list of factors affecting the state of women’s rights, the most important of which is a society-wide political and media backlash against the feminist movement. When I bring up the peril of theory, it is not on its own, but in the context of a turn away from activism. Early feminist artists (Judy Chicago, Miriam Schapiro, and others) had the “consciousness-raising” of an activist grassroots feminist movement as a reference point, whereas a later generation was more rooted in academic debate. You may agree or disagree with that assessment or my reading of its political consequences, but the focus is very clearly on the idea that it would be a great thing if there were more activism around women’s rights, not that woman’s rights ought to be subordinated to class struggle. So, what is going on here that might explain this obvious misreading? My guess is that Wetzler fixates on my fleeting reference to theory here because her key interest is art theory, not activist politics, whereas my emphasis throughout is on the relation between the two. Which brings me to the political stakes. The sentiment that we are “permanently” doomed to an unequal and squalid political-economic situation is not some brave minority position. Only someone who confused reflexive negativity with thoughtful critique would think so. On the contrary, it’s the most conventional possible type of thinking, beamed at us every hour from almost all mainstream outlets: Don’t think too big or expect too much. Confine yourselves to the pettiest possible political debates. Stay at home, or, if you are an artist, stay in your studio. To be fair, Wetzler is not wholly dismissive of my book, even if the impression she leaves of it is more negative than positive. I would like to think we have room for some common ground, but am unsure, reading her review, just what it might be. Here are some questions I would like to ask Wetzler: If you are out to defend the social relevance of art theory from my caricatures, which theories and why? Do you think that radical social change for the better is possible and not “permanently distant?” If not, why not? Either way, what is the significance of that belief for how you think about art and its place in society? Above all, what do you actually believe in, politically? I likely wouldn’t agree with all of Wetzler’s answers, but they would be the start of a conversation about the world we live in, the problems we are facing, and a strategy for moving forward. That is the conversation I think we should be having, and that Jacobin should foster.